Culture Minister Nelson McCausland today announced that the new Public Record Office of Northern Ireland (PRONI) will open to the public on 30 March 2011. Speaking from the new state-of-the-art facility in Titanic Quarter the Minister said: "In September 2009, we reported that the new PRONI headquarters was due to open in May or June 2011 following the removal and relocation of over 40km of unique, irreplaceable and some priceless, documents. It is therefore a fantastic achievement, through the careful planning, dedication and hard work of my staff and our partners, that the new PRONI is opening well ahead of schedule." Almost 90% of the records, which amount to over three million items, have now been placed in the four purpose built storage facilities which form the core of the new building. Upon completion of the move of the various collections, PRONI staff will undertake a full stock take to both ensure that all the records have arrived safely and that they are stored correctly in readiness to be ordered by the public when the building opens. As Keeper of the Records for Northern Ireland, Minister McCausland added: "The Northern Ireland Executive has committed around £29million to this project to provide Northern Ireland with a building which befits PRONI’s position as one of the three National Archival Institutions in the United Kingdom. "The new record office will provide larger and better facilities for the access of PRONI’s records. Through widening access all sections of the community will have the opportunity to experience a greater awareness and ownership of this part of their cultural heritage." Interest in personal history such as tracing family trees and in local history is on the increase. The location of the new building will mean much easier access for local, national and international visitors and will formally put PRONI on the map as a ‘must experience’ tourist attraction. 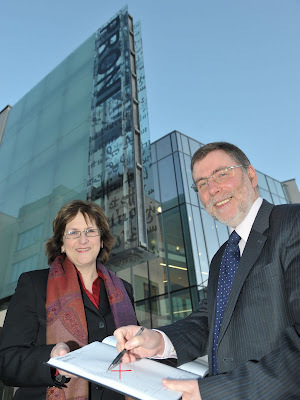 Image: Culture Minister Nelson McCausland is joined by Aileen McClintock, Director of the Public Record Office of Northern Ireland (PRONI) to announce that the 30 March 2011 will be the date that the new PRONI Headquarters at Titanic Quarter will open to the public. FindmyPast.co.uk has updated its English and Welsh BMD index facility from 1837-2005 by launching a new "Marriage Match" option - search the records once and the partner will be included in the returns. For more information visit the site's blog at http://blog.findmypast.co.uk/2010/11/fully-name-searchable-marriage-records-1837-2005-on-findmypastcouk/?utm_source=TW&utm_content=301110&utm_campaign=fullyindexedmarriages . The blog post does not mention it, but I am fairly sure the images from the indexes have all been rescanned as well, improving their clarity. An 1839 Shipwreck - a poem written by my five times great uncle after witnessing a ship wrecked off the Scottish coast. William the Womble - What happens when you mess about with a cultural icon? Learn how the Northern Irish residents of Carrickfergus in County Antrim reacted when a statue was unveiled in 1990 to celebrate three hundred years of the Battle of the Boyne. The Statistical Accounts of Scotland - after the ScotlandsPeople website, probably the most important online resource for Scottish genealogical research. Ireland is a really perplexing place for genealogical resources. Half the country is trying to bleed you dry financially to pay for resources - the other half is handing them to you on a plate! Top Northern Irish repository PRONI is once again leading the way - 100,000 images for wills probated in the north from 1858-1900 have now been placed freely online to accompany the already existant index, which has been on the site for a couple of years. AND - they have extended the coverage of the index to 1943!!! Commenting on the release, Culture Minister Nelson McCausland said: “One of PRONI’s key goals is to digitise key cultural resources and make them easily available to a worldwide audience. This free of charge application will therefore be of enormous assistance to anyone trying to trace their genealogical roots and will be of particular help to those wanting to begin their research from the comfort of their own home. This application provides a fully searchable index to the will calendar entries for the three District Probate Registries of Armagh, Belfast and Londonderry, with the facility to view the entire will calendar entry for each successful search. The database covers the period 1858-1919 and 1922-1943. Part of 1921 has been added, with remaining entries for 1920-1921 to follow in the near future. Digitised images of entries from the copy will books covering the period 1858-1900 are now available online, allowing users to view the full content of a will. 93,388 will images are now available to view. TNA is currently undergoing a major revamp, so things will be a little different if you haven't been in a while. Keep an eye on Audrey's The Family Recorder blog for further developments with the TNA site, but also about its newly released resources, interesting ancestral anecdotes and more. The latest issue of Discover my Past Scotland (Dec 2010, #26) is now on sale at www.discovermypast.co.uk. • Local archives – help is at hand! • Sea Life! – fishers in your family? 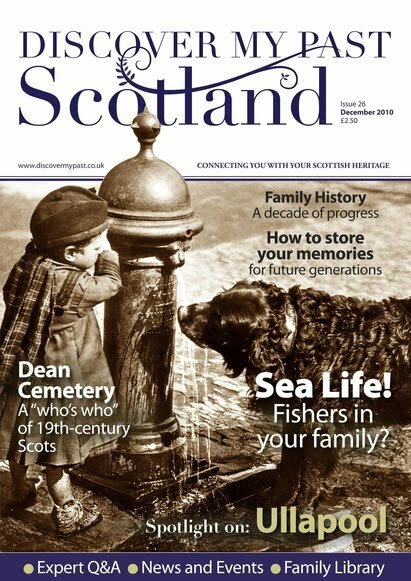 Yours truly also provides the latest news and reviews, as well as an article looking back at the development of Scottish family history resources over the last ten years. Duncan McAra, former honorary editor of The Heraldry Society of Scotland, has a letter in today's Scotsman newspaper, protesting at changes made in 2006 to the oath undertaken by new members joining the Order of the Thistle. The changes lose the words "I shall fortify and defend the Christian religion, and Christ's most holy Evangel, to the utmost of my power", which he is unhappy with. Personally I am not religious, and have no problem with the further secularisation of the state - however, as an institution with a religious heritage, he does make some interesting points about the need to maintain the order's traditions - such as why the need for a Dean of the Thistle if the order is to be secularised? If you haven't been back to the site in a while, now's your chance to do so to let us help you in your quest for information on your relatives. Due to changing demand, we have decided to alter our Tuesday/Friday evening opening hours, during the winter months. As of 8th December 2010, our evening opening hours will be from 6:00pm - 9:00pm on Tuesdays and Fridays. For more on the society, and its library, visit www.anesfhs.org.uk. To order this special offer, log in to your personal page and click on the special offers link in the left hand navigation bar. A link to the login page is provided below. ALL ORDERS MUST BE PLACED AND PAID FOR BY MIDNIGHT DECEMBER 1st 2010 TO RECEIVE THE SALE PRICES. Comhairle nan Eilean Siar is looking for views about a proposed new museum and archive service for the Outer Hebrides. If successful the venture will be based at Lews Castle in Stornoway, but with connections to all the main islands. Opinions are being sought from all comainn eachdraidh in the area and from the general public, and interested parties can fill in an online survey at www.tinyurl.com/museumnaneilean. A new museum and art gallery is to be built in Dunfermline, thanks to funding from the Heritage and Lottery Fund to the tune of £2.8 million. Who Do You Think You Are? Live today has new management, after BBC Magazines Bristol bought a majority share in the venture. The company publishes Who Do You Think You Are? magazine, and this is an interesting development considering that a few months ago BBC Magazines were apparently under serious threat of being sold off! Under the previous organisers, Brand Events Ltd, many family history societies and vendors found the annual WDYTYA? Live event a seriously expensive venture to attend - many did not bother, and last year some societies organised a separate venture at the Barbican entitled The Family History Event in protest, though a follow up up event next year has now been cancelled due to lack of support. Perhaps now the BBC has acquired an interest in the WDYTYA? Live venture it may consider the public interest with regard to the FHSs and considerably reduce the table prices - we'll see! But if you are a society that has been concerned, I would suggest now is a good time to make your feelings known to the new owners! The full announcement of the BBC Magazines take over is reported by Thomas MacEntee at his Geneabloggers blog post at http://www.stumbleupon.com/su/1ikd74/www.geneabloggers.com/new-management-wdytya-live//r:t - with many thanks to Thomas. The remaining portion of the Free Church of Scotland (i.e. the part which did not rejoin the Church of Scotland in 1929), still active in the Highlands and Islands, is having its first 'plenary assembly' since 1843 to discuss a proposal to introduce hymns and music to its services. And people wonder why the Church is in decline...?! The event started at 2.00pm and included several presentations, mainly linked in some way to the project, though not exclusively. If there were new buzzwords that I learned from the day, they were "crowd sourcing" and "georeferencing". Various definitions for crowd sourcing include 'delegating a task to a large group', or 'a process in which readers submit individual reports that are collected into a larger dataset for use in reporting a story'. Georeferencing can be defined as 'to design something's existence in physical space, relative to a standard reference grid'. I thought I'd briefly list those, as everyone was merrily using the terms in the way that I never do! Addressing History is a site that uses historic Edinburgh maps which have been matched up or georeferenced to a modern Google map. Entries from three directories - 1784/85, 1865 and 1905/06 - have been pegged to the relevant locations on these maps. The combination provides for a potentially powerful search tool - if I want to search for all photographers in 1865 and then compare to the same search in 1905/06, I can perhaps observe a shift in the location of the photographic community in those eras, for example. The crowd sourcing comes into play in the way that the general public is now being asked to interact with the site, to help improve the work of the OCR (optical character recognition) scanning and more - in the same way that the Australian newspaper site from the National Library of Australia allows for users to go in and make corrections to its OCR scans which are displayed in parallel with the digitised images. The event started with Professor Robert Morris from Edinburgh University, perhaps an odd choice for the first talk in that he defined many of the flaws of the AddressingHistory site before the AddressingHistory folk could actually define what the site was! However, there was a serious point to his talk. The new site is still very much a beta project with much development still to go through, and his talk raised many of the challenges that the project has had to contend with and which it still has to deal with - not least of which the use of OCR which at times has experienced a 40% error rate. There are also several restrictions and quirks of the directories themselves that can create some issues - the occupation search field, for example, is not much use if the women listed in a directory are not listed with an occupation, and the fact that it is difficult to compare like with like between directories, as the directories themselves changed so much from one version to the next. The professor's summary of the site was that it was "a ship ready for launch but still not quite ready for sea". An interesting presentation, but I'll admit to not being quite sure whether the good professor's glass was half-full or half-empty! Stuart McDonald and Nicola Osborne then took the floor- both work for EDINA and are heavily involved with the project. Stuart explained that the AH project had been funded by JISC from April-September 2010, and partnered by the the National Library of Scotland, which sourced the Post Office Directories(or 'PODs' as they were called throughout). Nicola mentioned that the first phase of the project was to physically link the data with the maps, and that the next stage now was to launch the site and to ask the public to help "get the data up to scratch" - the site itself went online officially at 3pm during their chat. It was announced that EDINA will continue to support the project for at least the next year, and that models were currently being investigated for the longer term future of the site, possibly through donations. But now is really the evangelising phase - get the word out, and show the potential of the site. Nicola also mentioned that she is particularly interested in further guest posts for the AH site's blog. Professor Richard Rodger of Edinburgh University then took the floor to talk about the Visualising Urban Geography project at http://geo.nls.uk/urbhist. This is like a much bigger version of Addressing History, in that it is trying to link data from various sources to contemporary maps. An extraordinary project, but rather than have me attempt to define it, visit http://geo.nls.uk/urbhist/examples.html for several examples of projects being worked on! There then followed a presentation by Helen Chisholm on the Statistical Accounts of Scotland, as hosted online by EDINA. I've used the accounts a lot, but not the subscriber's version of the site. Very interesting additional features, but I will post on this on my Walking in Eternity blog (http://walkingineternity.blogspot.com/) in the next few days. Suffice to say that there are some developments on this front, so stay tuned. Then followed a master session on georeferencing from the NLS's Chris Fleet. Chris explained how sites such as Google carve up the world using a programme called Map Tiler, and how this forms the backbone of several current NLS mapping projects. In addition to the OS maps online at the NLS website, he also explained that the library has a map collection called OS Mastermap available at the buidling but not online, which holds the most detailed OS maps in Britain. Other projects using georeferenced map dat from the NLS include the gazetteer site at www.scottish-places.info, Heritage Paths at www.walkingthroughtime.co.uk, the Portable Antiquities Scheme site at http://finds.org.uk/, the Society for All British and Irish Road Enthusiasts site at www.sabre-roads.org.uk (the history of roads - amazing site! ), ScotlandsPlaces at www.scotlandsplaces.gov.uk, the Stravaiging Around Scotland site at www.stravaiging.com and many more, a few of which I had never heard of before but which I will be plundering in due course! Future mapping additions to be added to the NLS's own maps website will include 6000 sheets from the OS 6 inch and 25 inch maps from the 1890s-1940s, as well as many Bartholomew's maps. Native Uisteach Kenny Beaton then gave a talk on the Tobar an Dualchais / A Kist o' Riches project, accessible online at either www.tobarandualchais.co.uk or www.kistoriches.co.uk. This is a £3 million audio digitisation project which ran from 2006-2010 and which has digitised 12,000 hours of Gaelic and Scots recordings (the equivalent of 3 1/2 years of listening). The material includes 10,000 hours of recordings from the School of Scottish Studies, the National Trust's Canna Collection (400 hours of recordings by John Lorne Campbell, inclusing material in Nova Scotia), BBC Scotland output from 1950-2005, and more. Each recording was digitised at 4 times the quality of a CD for archival purposes, requiring some 12 terabytes of storage. Not all is available online, but you will find 50,000 tracks available, and free of charge. Although the site does not officially launch until December 9th, it is up now - well worth a visit. The most enjoyable talk of all was by the National Library's Ines Mayfarth. Ines gave a talk on her work to digitise the 750 Scottish directories from the 1770s to 1911 for the Internet Archive, covering Edinburgh, the Lothians, Glasgow, Stirling, Perth and Kinross, Dundee, Angus, Aberdeenshire, Invernessshire, Moray, Renfrewshire, Bute, South Ayrshire, Inverclyde and Dumfries. As well as material from the NLS, various partner organisations are helping to plug gaps in the NLS coverage, though Ines did mention that the Mitchell in Glasgow was still to be convinced! Hopefully the Mitchell will get fully on board, because frankly, the state of some of the directories at the Mitchell leaves a lot to be desired (some of their directories are literally falling to bits), and digitisation should really be a priority. Ines and her team scan 24 images per minute, and she describes the OCR accuracy of the scans to range between 50% and 90%. To help with searching, the NLS is creating a new index of the 1st three letters for every surname on each page within each directory, and the first books will be made available on the NLS website by Christmas, in the family history pages area, and by Autumn of next year a dedicated site will be launched for all the directories. It was a great event centred around Addressing History, and an exciting glimpse of what the NLS sees as the way ahead with some of its key projects. Thanks to the team for the invite, and best of luck with the project's furture development, because it has some seriously useful potential, not just for academia but for the humble family historian also! MAJOR news - Scottish ministers yesterday gave their support to the proposal that the General Register Office for Scotland (www.gro-scotland.gov.uk) and the National Archives of Scotland (www.nas.gov.uk) should merge. In other words, it is going to happen. There are no details as yet as to when this will formally happen, but my understanding is that there are no plans to affect the level of service provided by each organisation. It is unclear as yet as to whether Registers of Scotland (www.ros.gov.uk) is to be included. 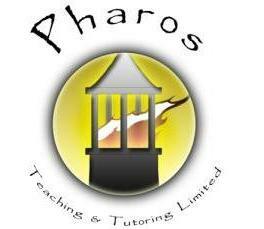 Earlier in Glasgow today I caught up with Helen Osborn, head honcho of Pharos Teaching and Tutoring Limited (www.pharostutors.com), which teaches short online genealogy courses at an affordable rate. I teach two courses through Pharos, Scottish Research Online and Scotland 1750-1850: Beyond the OPRs, but there are many others that may be of interest to those with Scottish ancestry, and indeed any British or Irish ancestry. Rather than point at myself and risk breaking the lens of my very nice but disappointingly small camera, Helen very graciously agreed to let me grill her nicely about what Pharos is instead, and to share what the company has to offer. Thanks Helen! For more information on the courses, please visit the website. Today I attended a packed afternoon programme of talks at the National Library of Scotland for the formal launch of the new Addressing History website at http://addressinghistory.edina.ac.uk, which officially went live at 3.00pm. I have lots to write up about the event, though as it has just passed midnight that will be a job for my next post! In the meantime, here is a short five minute interview that I was able to carry out at the event with Nicola Osborne, Addressing History Project Officer and Social Media Officer for EDINA, which provides a brief introduction to the whole Addressing History project - thanks Nicola for your time! The new board and committee for the Association of Professional Genealogists has just been announced - congratulations to Irish based genealogist Eileen O'Duill for winning the position for the region covering the British Isles. Region 1 – West: Mary Penner (New Mexico) has been elected to a second term on the board. She chairs the Professional Issues Committee, has lectured at two APG Professional Management Conferences and has been a frequent contributor to several genealogy publications. Beverly Rice, CG (Oregon) is a past APG treasurer and secretary and currently works on the APG Roundtable committee. She is a trustee for the Board for Certification of Genealogists and is the director of American Studies for the National Institute for Genealogical Studies. Region 2 – Midwest: Harold Henderson (Indiana) is a professional genealogist and writer who has authored numerous books and articles. He serves on the board of his county genealogical society and writes the Midwest Microhistory blog. Debbie Parker Wayne, CG (Texas) is a founding member of APG’s Lone Star Chapter and has managed publicity for the APG Professional Management Conference for the past two years. She is the webmaster for many sites, including that of the ProGen Study Group. Region 3 – Southeast: Diane Giannini, CG (Virginia), serves on the board of the Mid-Atlantic Germanic Society and is past-president of the Charles County Maryland Genealogical Society. She has written for Digital Genealogist and NGS News Magazine. Donald W. Moore, CG (Virginia), elected to a second term, is past president of the Virginia Beach Genealogical Society, incumbent vice president of the Virginia Genealogical Society and editor of its newsletter. He has also written for Digital Genealogist and has provided reviews to several genealogical publications. Region 4 – Northeast: Amy E.K. Arner (Pennsylvania), elected to a third term, is a professional genealogist specializing in Western Pennsylvania, the past-president of the Great Lakes Chapter and a proofreader for the APG Quarterly. Kimberly T. Powell (Pennsylvania), author of several books, has written and blogged about genealogy for About.com for more than 10 years. She conducted research for the PBS show, Faces of America. International Region 5A: Eileen O'Duill, CG (Ireland), elected for a third term, specializes in international probate research and has lectured at national conferences in the United States and in Ireland. She has worked on programs to grow APG’s presence internationally. International Region 5C: Carole Riley (Australia), elected for a second term, is a genealogist based in Sydney who specializes in New South Wales, including convicts, migration, probate and more. Nominations Committee: Brent Morgan (Virginia) is the chair of the Society of Civil War Families of Ohio and is the registrar for the Richmond, Virginia Chapter Sons of the American Revolution (SAR). Gena Philibert Ortega (California) is the genealogy community director for FamilyLink, where she is newsletter editor for WorldVitalRecords and manages GenealogyWise. She has authored more than 100 articles published in a wide range of genealogy publications. She serves as vice president for the Southern California Chapter of the Association of Professional Genealogists. The Association of Professional Genealogists (http://www.apgen.org), established in 1979, represents more than 2,400 genealogists, librarians, writers, editors, historians, instructors, booksellers, publishers and others involved in genealogy-related businesses. APG encourages genealogical excellence, ethical practice, mentoring and education. The organization also supports the preservation and accessibility of records useful to the fields of genealogy, local and social history. Its members represent all fifty states, Canada, and thirty other countries. Aberdeen City Council is hosting a new online exhibition about life on the home front in Aberdeen and Aberdeenshire during the Second World War. Bletchley Park, the home of Station X where Turing worked to break German ciphers during the Second World War, does its part to keep him in our memories - but it needs our help. Auction house Christies is to auction off a vast quantity of Turing's offprints, including his first published paper. They belong in a dedicated museum, but Bletchley Park can't afford the £300,000-£500,000 guide price. As a result, I'm asking for volunteers to dig deep and see to it that these papers not only stay in this country, but stay where the public can see them and benefit from them. Let's save them from being locked away in the vaults of a private collector. It's a big ask, looking for half a million pounds, I know - but if you work for a high-tech company, use a 'universal computer,' or are in any way connected with modern computing, you owe Turing a debt of gratitude - and this could be a way to help repay that debt. If you'd like to donate, please do so as soon as possible - the auction is on the 23rd of November, so we haven't got long if we want to save this historic treasure for future generations to enjoy! A donor today gave the campaign £10,000, but they are still well short of the half a million needed - if you can help, please give as much as you can! Edinburgh, Lothians and Borders Archaeology Conference 2010 will take place on Saturday, November 20th (9am - 5pm) at the Queen Margaret University, Musselburgh. If you can't make it, the team will be putting videos of the speakers online after the event, and yours truly is already signed up to attend and will blog merrily about what I find when I return! A HUGE thanks to Lanarkshire Family History Society (www.lanarkshirefhs.org.uk) for its warm hospitality once again, at the talk I gave on Thursday concerning the Mount Stewart Murder of 1866, which seemed to go down well! That's me all talked out now until February! I'll be leading a writers workshop with Largs Writing Group at the Masonic Hall, Gateside Street, from 10-12 on February 7th 2011, and then giving two talks on using Irish records online in March - at the Saint Patrick's Festival on Saturday March 12th at Coatbridge Library (time to be confirmed) and then again at the joint meeting of the four Ayrshire family history societies on Wednesday March 23rd 2011 at the Session House, St. Columba's Parish Church, Largs, from 7.30pm. But there is no rest for the wicked - I have two more books to write before June, and a lot of client work to carry on with - and a huge apology to those who have been waiting for me, but there is now light at the end of the tunnel, and I'll be in touch in due course! It's only been on sale for a few weeks, but the first update to Family Tree Maker 2011 is already available for download, to correct certain minor user issues. It's the UK's longest unsolved murder case - and I'll be doing a talk about it tomorrow night (Thursday 11th November) at Lanarkshire FHS, from 7:00 pm - 9:00pm at the GLO Centre, 78 Muir Street, Motherwell, ML1 1BN. The Mount Stewart Farm Murder happened in Forgandenny in 1866, and involved the brutal axe killing of my three times great grandmother Janet Rogers (nee Henderson). Come along and find out what happened - and discover the sting in the tale some two decades later. The talks, which are free of charge, will start at 1pm in the Performance Area of the Linenhall Library. Everyone welcome. I have transcribed the Rental Book for Ochtertyre Estate for the period 31 August 1865 until 31 August 1866 .The Estate which belonged then to the Murrays of Ochtertyre lay to the west and east of the town of Crieff. The Rent Roll gives the names and addresses of the tenants of the time. Thanks to Ewan * for rescuing the ledger from the pending flames. Posterity is grateful! In November last year I blogged that the National Archives of Scotland was beginning a project to catalogue the papers of First World War Military Appeals Tribunals involving conscientious objectors in Edinburgh, the Lothians and the Borders, as held at the NAS under HH30 (see http://scottishancestry.blogspot.com/2008/11/first-world-war-scottish-military.html). The NAS has today announced that the project has been completed, with individual entries now fully searchable on its online catalogue. For more on the story, visit www.nas.gov.uk/about/081103.asp. Alloway and Southern Ayrshire Family History Society (www.asafhs.co.uk) are holding a meeting in The Church Halls at Alloway on Tuesday 16th November 2010 at 7.45pm. The speaker is a genealogist called David Webster, who will be discussing "Scottish Military Records". Visitors are welcome to the event, and the entry charge is £1.50, which will include a light refreshment. At last, the definitive word from the National Archives of Scotland on the news first posted here last week on local access to kirk session records - and it's great news, with more records available than I at first thought!! A new service that opens up access to the digital images of millions of pages of church court records has been launched by the National Archives of Scotland (NAS). Until now researchers in many parts of Scotland have found it difficult to travel to the archive where the records are physically held. Now for the first time the NAS and many local archives are combining to offer a service that researchers can use to get access to records from across Scotland. The service is being rolled out from November 2010, and it is hoped that more than a dozen local archives will be places where digital copies of the records can be consulted, in addition to the NAS itself. Please contact the relevant archive for details of opening times and access. Later in 2011 it is planned to make the church records more widely available online via a subscription-based service. It is expected that this will be undertaken by ScotlandsPeople, the family history website which NAS runs with the General Register Office for Scotland and the Court of the Lord Lyon. Researchers will have the choice of accessing the records free of charge in various Scottish archives, or using the subscription service. The Scottish Reformation saw the introduction of a new system to run church affairs: the General Assembly, synods, presbyteries, and kirk sessions. Presbyterians who later broke away from the Kirk also adopted a church court system. The records created by church courts are very useful for family history, local history and academic research. Of most interest for genealogists and local historians are the minutes of the kirk sessions, which typically contain a detailed and often colourful record of the discipline the minister and kirk elders handed out to errant parishioners for offences such as drunkenness, swearing, breaking the Sabbath, quarrelling and sexual misdemeanours. Other records include proclamations of banns, communion rolls, seat rent books and poor relief accounts. Deposited in the NAS in 1960, church court records are cared for by the NAS and by local archives under charge and superintendence of the Keeper of the Records of Scotland. They include the records of secession church congregations which rejoined the Church of Scotland. There's more at the full release at www.nas.gov.uk/about/101101.asp. This database contains lists of more than 1.5 million officers, enlisted personnel and other individuals entitled to medals and awards commemorating their service with the Royal Navy and Royal Marines between 1793 and 1972. The original medal rolls were compiled by the War Office and are housed at the National Archives of the UK in Kew, Surrey. The rolls include medals awarded for British campaigns and service in Europe, India, Africa, Asia, the Middle East, and elsewhere during the height of the British Empire and into the 20th century. This database also includes medal rolls from the First and Second World Wars. Also, from Ancestry's Canadian arm, two new collections - Canada, CEF Commonwealth War Graves Registers, 1914-1919, and Canada, CEF Burial Registers, First World War, 1914-1919. See www.ancestry.ca/Remember for more information. Are you related to William Marr Constable, Charles F Fox or Andrew Scott Greig, all of whom died on June 6, 1918 at a farm in the village of Flêtre in northern France? If so, the Centre for World War Two Studies in Edinburgh wants to hear from you, on behalf of the French building's present owner Didier Godderis. Electoral registers, or registers of voters, are lists of individuals who are eligible to vote during the time the register is in force (usually one year), and genealogists use them to establish a place and time of residence. Many voters on the lists in this database became eligible to vote after parliamentary reform passed in Scotland in 1832 expanded the country’s electorate from about 4,500 to 65,000 voters by lowering the property requirement for franchise to £10. Subsequent legislation would further extend suffrage in Scotland, though women would not be given the vote until the 20th century. Records can be searched by place of residence, register year, and name. Records may also include occupation, street or street address, whether a proprietor or tenant, description of property, and a name of a village, farm, or property. Curretly under prepartion throgh the project is the Tax & Rent Records Perth, Scotland and the Valuation Registers Perth, Scotland collections, as well as the England, Register of Duties Paid for Apprentices' Indentures, 1710-1811, though I'm guessing this will also include the Scottish returns, as they are all held at TNA. Despite thirty years of going strong with the same club badge, Formartine United in Aberdeen has now been forced to petition for the use of a set of Arms after a complainant informed the Court of the Lord Lyon that the team was illegally using the saltire and lion rampant in its badge. The full story is at www.pressandjournal.co.uk/Article.aspx/1954119, whilst the football club's response is noted at www.formartineunited.co.uk/news.asp. In its response the club's chairman Atholl Cadger stated "Formartine United have decided to petition the Court of the Lord Lyon for a grant of arms within the next 28 days. The Procurator Fiscal has been very accommodating over the last few weeks which the Club fully appreciates." Paton Street: Flag on the moon - why the Patons will live forever in Australia! Toilet Troubles in 1840s Perth - always trust your doctor, even if he goes this far! The new blog is online at http://walkingineternity.blogspot.com/ - enjoy! Another class act on the blogging front to point towards - the Scottish Emigration Blog at http://scottishemigration.blogspot.com. Written by Amanda Epperson, who recently completed a PhD at Glasgow in history (specialising in Scottish migration), the blog is an eclectic mix of posts on a variety of topics, all historically themed. Enjoy! Ancestry.com, Inc, parent company of the UK's number one family history website Ancestry.co.uk, in collaboration with UK website TheGenealogist.co.uk, is pleased to announce that an agreement has been reached with The National Archives to acquire and publish online the 1911 England and Wales Census. The two family history companies will work together to transcribe the 1911 Census, creating a searchable database which enables users to type in a name and go directly to the full colour digital image of the actual census document, handwritten in their ancestor’s home a century ago. The complete set of 1911 Census records go live on Ancestry.co.uk and TheGenealogist.co.uk by county, starting in late 2010 and completing in 2011. Part of the archival holdings of The National Archives, the 1911 Census is the largest and most recent census available to the public . A crucial genealogical resource, it offers a detailed insight into how people lived in the years leading up the First World War, showing who lived where, with whom, their age at the time of the census, their place of birth and what they did for a living. Olivier Van Calster, Vice President of Ancestry International, comments: “We are thrilled to acquire the 1911 Census and look forward to the moment members can access these valuable records on our site. Nigel Bayley, Managing Director of TheGenealogist.co.uk comments: “The 1911 Census is a crucial step for many in finding their roots and we feel this is a vital resource that will benefit family historians everywhere. Our members voted this resource their number one dataset in a recent survey. “In combination with our unique tools specifically developed to break down brick walls in genealogy, this will be a big step forward in research facilities.